Bow ties! I've been making quite a few as samples for my Hand Sewing & Bow Tie class at Needlework. I've been clipping them to everything, just because bow tie clips are so enjoyable. (You can see a drawing of what they look like on the illustrated instructions). In the class, we will be covering a few extras, but here are the basics to make your own at home. (Also check out the bow tie tutorial on A Beautiful Mess... we used slightly different methods, but their way is good, too!). 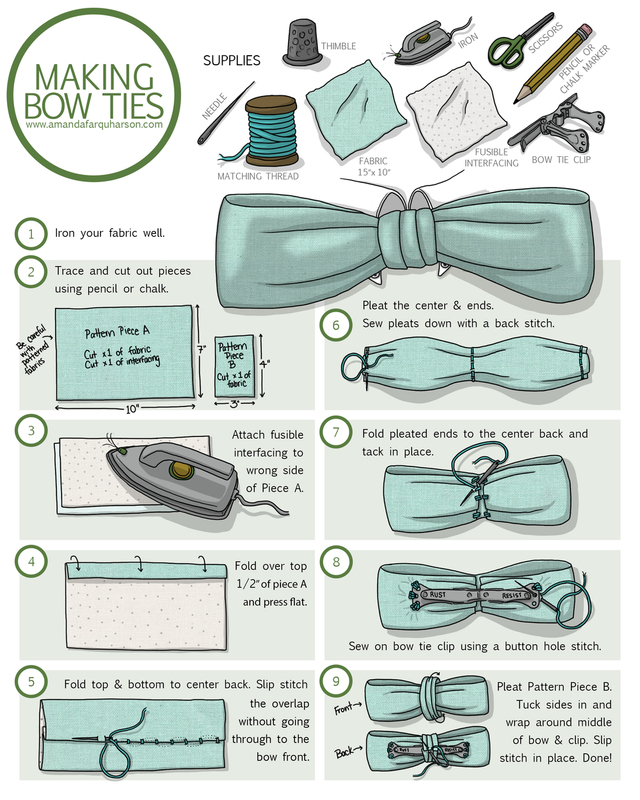 These instructions are for hand sewn bow ties (no sewing machine required), but some parts are easily done by machine, so if you have one, feel free to go ahead and use it! All of these bow tie fabrics came from Needlework, aren't they awesome? Iron your fabric. This is the last chance you have to get rid of wrinkles before they are sewn into the bow forever, so don't skip this step! Fold over the top 1/2" of piece A and press it flat. Fold top and bottom of piece A to the center back. Slip stitch the overlap closed. Make sure you don't stitch through to the front layers! Pleat the center and ends of piece A. Sew the pleats down with a hand back stitch. Fold the pleated ends into the middle and tack into place. Sew on the bow tie clip using a button hole stitch. Pleat pattern piece B, tucking the raw edges under so it looks finished. Wrap the pleated piece B around the the bow and slip stitch it in place on the back, over the bow tie clip. And that's it! It takes me less than an hour to make one, but I have also made more than my fair share of bows. Apr 6 The Makins House!